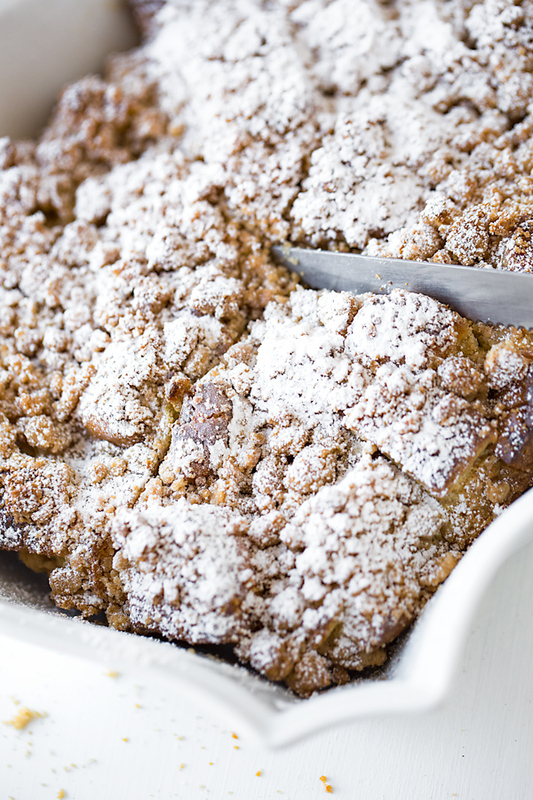 This easy French toast casserole with cinnamon crunch topping is golden and caramelized on the outside, pillowy and slightly creamy on the inside—it’s everything I crave in traditional French toast, but simplified! It was a few weekends back when my intense craving for French toast struck. I wanted French toast for dinner—something that the hubs and I sometimes like to have when we’re in the mood for some comfort food that leans in the direction of sweet and “breakfast-y”. I’d been craving that golden, pillowy, crisp-on-the-outside-slightly-creamy-in-the-center indulgence for days by that point. But here was the problem: I didn’t want to go out… And, I was feeling lazy! The last thing I wanted to do was to stand at the stove dippin’ & flippin’ pieces of toast, frying them up in a pan one at a time—that process was simply too involved for my liking on that particular late afternoon. So I had to come up with a more simplified alternative to get my French toast fix. Enter this French toast casserole recipe where everything gets tossed together and into a big baking dish! Win! It couldn’t be easier to make a hot, fresh, delicious French toast casserole when you’re craving French toast, but aren’t craving the somewhat-lengthy process of preparing it. And that’s exactly what makes this the perfect recipe when you’re looking for a quick, throw-it-in-the-oven breakfast for the next morning, or would like to enjoy some breakfast for dinner, like me! Cube up some good bread into large chunks (rich brioche bread is amazing for this), and place it into a large bowl. Whisk together some eggs, vanilla, half and half (or milk), a touch of sugar and some cinnamon, and pour that custard mixture over the cubed bread, and very lightly toss to coat. Turn the mixture out into a prepared baking dish, cover with foil, and allow it to rest in the fridge for at least 3 hours so that the flavors marry and everything soaks in; or even longer if you’re looking to prepare this as an overnight French toast casserole for breakfast the next day. (It isn’t totally necessary that you allow the casserole to rest if you’d prefer to prepare and serve it immediately, it just helps it be a bit more puffy and light). Combine your ingredients for that delicious crisp topping, part of the package when it comes to French toast casserole. I love to make a cinnamon crunch topping for mine—so good! Then, when ready to bake, remove the foil, sprinkle on your topping, and bake for about 35-40 minutes until golden-brown. And that’s it! No dippin’ and flippin’ involved! 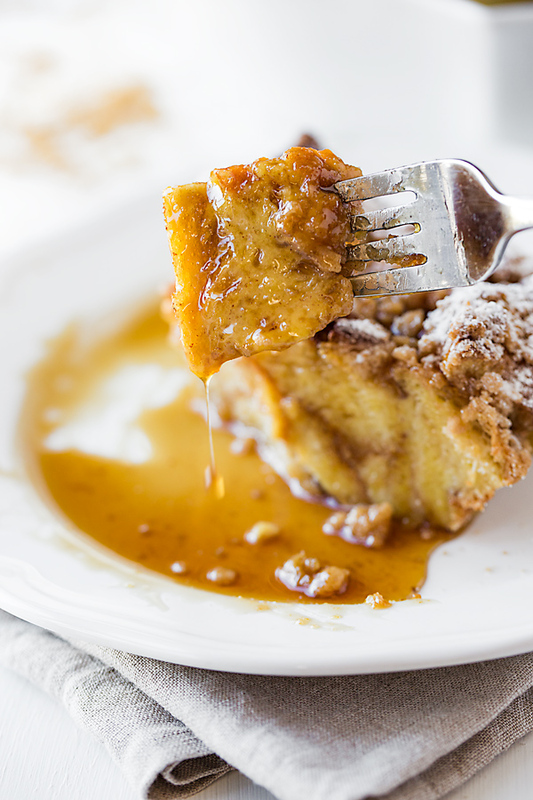 You’re now ready to dive into the easiest form of French toast you’ve ever enjoyed in this simple and ridiculously scrumptious French toast casserole. Give it a rest: In order to have the puffiest French toast casserole, allow your assembled casserole to rest in the fridge for about 3 hours before baking it (you can even go longer to make it an overnight French toast casserole). Of course, you can bake it immediately, but allowing it to rest and absorb the flavors and the custard helps create that perfect consistency. Optional add-ins: I love my French toast casserole nice and plain, because it best reminds me of traditional French toast; but feel free to add in raisins, chocolate chips, dried cranberries, fresh blueberries, or even pecans. Easy to re-heat: Leftovers totally come back to life when reheated for about 5-10 minutes at around 350° in a toaster oven—tastes just like fresh! 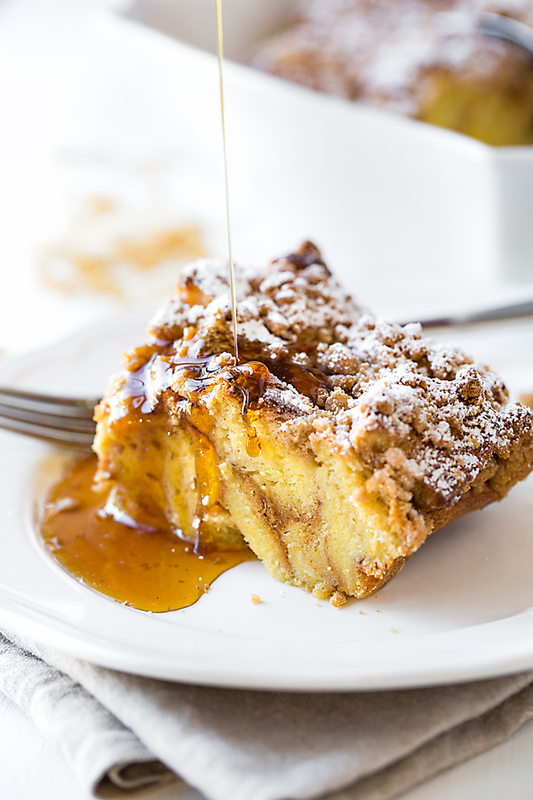 Divinely soft and sweet, and with a crisp cinnamon crunch topping, this baked French toast casserole is the easiest way to serve up one of your favorite breakfast foods—you’ll never want to make traditional French toast again! –Lightly mist a medium-size baking dish with cooking spray; set aside. –To prepare the casserole, add the cubed brioche into a large bowl; in another bowl, whisk together the eggs, half and half, sugar, vanilla, pinch of salt, and cinnamon, and pour this custard over the cubed brioche; toss very gently and carefully as to not break up the cubes, just until combined, and turn out into your prepared baking dish. 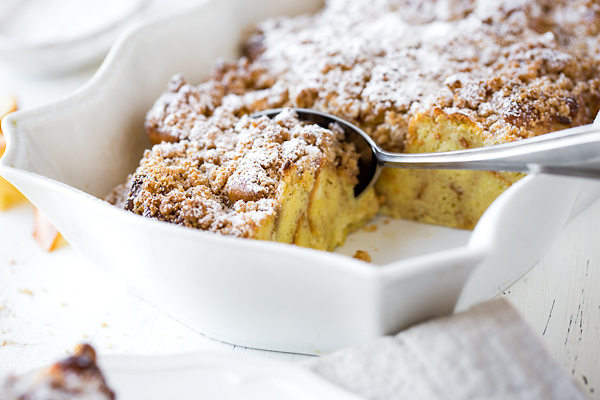 –While your casserole rests, prepare the cinnamon crunch topping by combining the brown sugar, the cinnamon, the pinch of salt and the melted butter in a small dish, and mix with a fork; add in the flour, and blend that in with the fork until crumbly; set aside in the fridge until you’re ready to bake the French toast casserole. –When you’re ready to bake, preheat the oven to 375°. 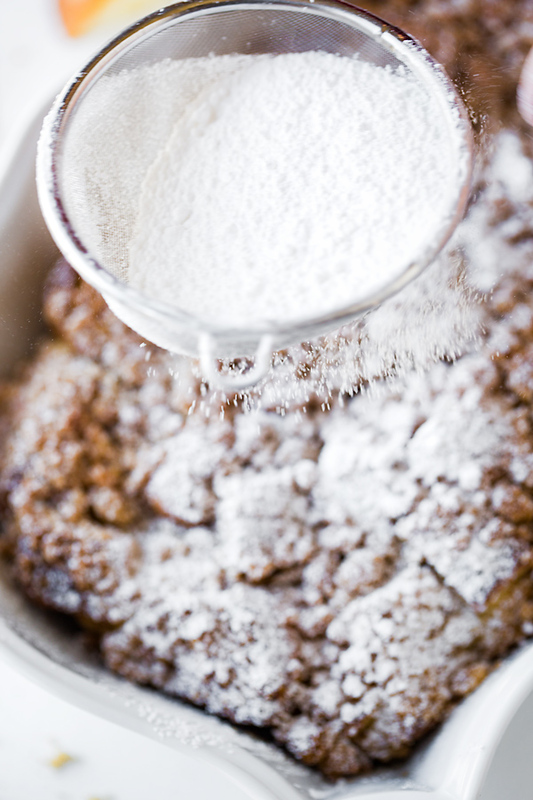 –Sprinkle the cinnamon crunch topping over top of the casserole and bake, uncovered, for 35 minutes turning half-way through the cook time; after 35 minutes, turn off the oven, and allow the casserole to stay inside for another 5-7 minutes; then, remove from oven, dust with powdered sugar, if desired, and serve with maple syrup. And if you’d like to see another French toast recipe (a more traditional one), check out this sweet Caramel Apple French Toast! And now I’m craving french toast. Gah, this looks so good! I love this Sunday “ritual” of yours—how fun! 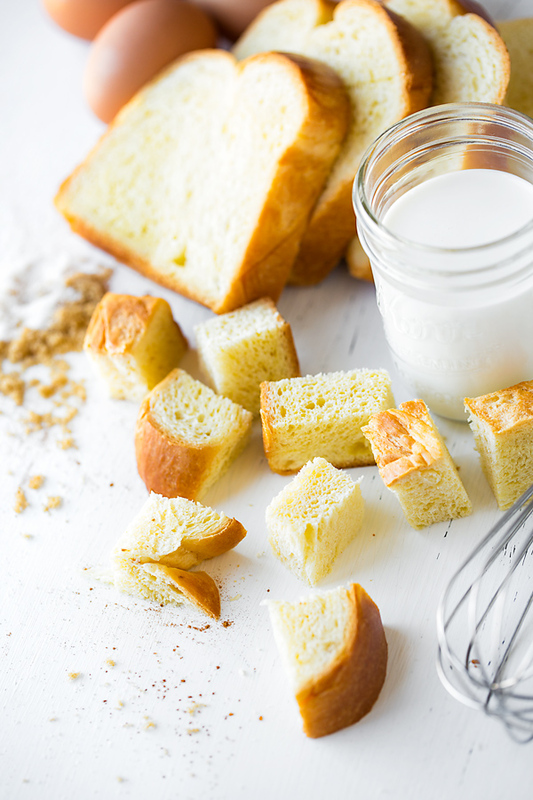 Yes, if you’re already a fan of “eggy bread” recipes, I really think you’ll enjoy this simple and sweet casserole…happy cooking to you! Can you use regular bread or perhaps some hamburger buns I need to use? Hi Skye, if you’re looking for a use for those hamburger buns and don’t know what else to make with ’em, why not? This is the perfect holiday breakfast item. And PS – just made a 1/2 batch with some leftover bread for dinner tonight. Sandy, that made me so happy! Such a great way to use up some leftover bread— make a small batch! could you make this, possible, plain and not in small pieces but whole slices and bake it? 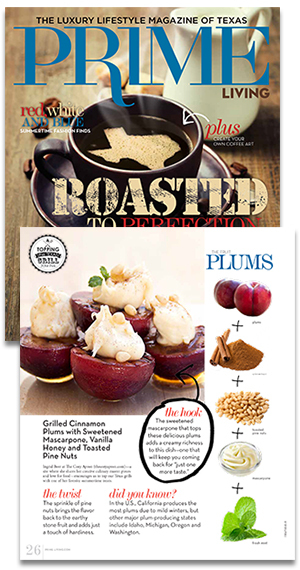 I saw one that had a blueberry compote on top, not sure if you would put the compote before baking it or after. Could you give me advice on this? thank you! Unfortunately, I cannot advise you on preparing this using whole slices of bread, as I have not prepared mine this way. You can make it plain, meaning that you can leave off the cinnamon-crunch “topping” if you wish. As far as the blueberry compote, you can certainly use my recipe for that! It’s super easy and perfect for this. And you would not top it before baking the casserole, but afterwards, just before you serve it, if you wish. I actually serve my compote warm on the side, so everyone can take as much as they like, and the casserole doesn’t become soggy (especially if you have leftovers). Just a suggestion 😉. What size is a medium baking dish? Thanks! 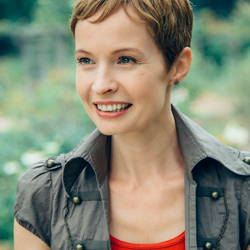 Hi Carolyn, I measured mine so you could have a good estimate: it was roughly 12″ (length) x 8″ (wide) x 2.5″ deep. So like a 13 x 9 (slightly on the deeper side rather than shallow) would be fine. We have it in the oven now! I did it with Christmas leftover breads and did a double batch using 2 cups eggnog and one cup whole milk. A true Christmas leftovers casserole. Sounds delicious, Kim! Yes—true Christmas leftovers casserole…it’s the beauty of a casserole, right? Is the bread supposed to be ‘doughy’ after baking for the recommended time? I’ve never made a french toast casserole and I don’t know what the consistency is supposed to be. The flavor is phenomenal.